These extensions installation package do not contain any Sothink Widget. It will not install any Sothink Widget on your system but the extension itself. To use a Sothink Widget, please download and install it additionally. If not, a pop-up message will prompt you to download it at first when you select the Widget from the menu entry. The unregistered version can be used in 30 days only for evaluation purpose. It only supports generating THREE links for nodes when you preview or publish the tree menu. 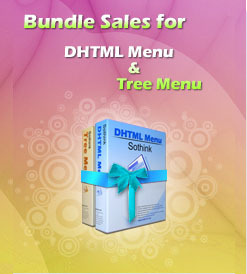 How to unlock DHTML Menu after I download it? A step by step instruction on how to unlock Sothink products. Free to build drop down menus with no DHTML skill! Fast to solve your problem and share experience! Fresh to release the latest news about menu products.